Powerful Typhoon Koppu (also known as Lando) has hit the northern Philippines battering the coast with powerful winds with speed of 240 kph. The eye of tropical cyclone (typhoon) Koppu has struck the remote northern coastal town of Casiguran which is 215 kms northeast of Philippines capital city Manila. US military’s Joint Typhoon Warning Center has categorised this typhoon equivalent of a Category 4 on the Saffir-Simpson Hurricane Wind Scale. 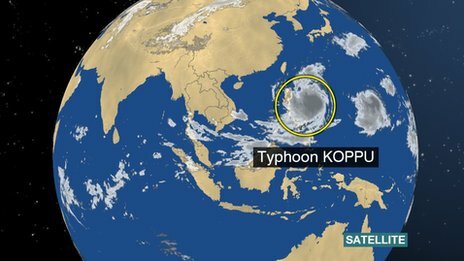 The Typhoon Koppu is considered as the strongest landfalling of tropical cyclone in past five years faced by Philippines. The most ominous threat of this cyclone is its prolific rainfall which may cause flood like situations followed by mudslides across the mountains and valleys of Philippines main northern island of Luzon. Each year, Philippines is hit by an average of 20 tropical storms, most of them many are deadly. The North eastern coat of the country is one of the most tropical cyclone-prone coastlines on Earth.